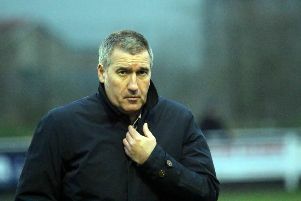 Brackley Town boss Kevin Wilkin was left to rue costly errors following Saturday’s defeat against in-form Altrincham. Saints slipped to only their second Vanarama National League North defeat of the season. Altrincham continued their march up the table with a deserved 2-1 victory at St James Park as Wilkin’s side fell to a first home defeat since early August. Andy White’s second half goal proved enough as Saints failed to find an equaliser. Simon Richman gave Altrincham the lead but Saints found an instant reply through Glenn Walker. The winner arrived just after the restart from White and this time there was to be no comeback. Wilkin said: “On the day the mistakes we made ended up costing us the game. They passed the ball well but, for me the two goals we conceded were gifts, and in a big match those mistakes have cost us. “Once they were ahead they managed the second half well but we had too many players who weren’t where they needed to be. Overall, it was the flattest performance of the season so far.